Darren Osborne’s attack at Finsbury Park mosque was the fourth terrorist incident in the UK this year. He was charged with terrorism-related murder and attempted murder. It again brought up the question of whether incidents that many would call “lone wolf” attacks should be regarded as terrorism. Last year, the tragic murder of the MP Jo Cox by Thomas Mair spurred a similar debate – should Mair be considered a terrorist? Many took to social media to say that Mair was not considered a terrorist because of his ethnicity and because he’s not Muslim. Mair’s sentencing remarks didn’t include the word terrorist. By contrast the sentencing remarks for Lee Rigby’s killers Michael Adebolajo and Michael Adebowale did refer to terrorism. But in fact Mair was considered a terrorist by the Crown Prosecution Service (CPS). At the time of Mair’s sentencing, Sue Hemming, Head of Special Crime and Counter Terrorism at the CPS, said Mair’s “pre-meditated crimes were nothing less than acts of terrorism designed to advance his twisted ideology”. The CPS has a section on their website called: “Terrorism or Not?” that refers to the killings of both Lee Rigby and Jo Cox. Both were charged as murder by the CPS, and both amounted to a terrorism offence. Terrorism is “notoriously undefined in international law”, according to David Anderson QC, the former Independent Reviewer of Terrorism Legislation. He wrote in his latest annual review that the UK’s definition of terrorism was “over-broad”. In the Prevention of Terrorism (Temporary Provisions) Act 1989, terrorism was defined as “the use of violence for political ends” including “any use of violence for the purpose of putting the public or any section of the public in fear”. The definition was widened in the Terrorism Act 2000, to include “the use or threat” of “serious violence” that advances “a political, religious or ideological cause.” The word “racial” was added in 2008. Terrorism in the UK can be categorised into three types: international terrorism, domestic terrorism, and Northern Ireland related terrorism. Islamist terrorism (included in the category international terrorism) remains the principal threat in the UK. Many would define terrorism differently depending on their age, says Dr Sascha-Dominik Bachmann, Associate Professor in Law at Bournemouth University. Tayab Ali, a specialist terrorism defence lawyer, says over-designating far right criminal acts as terrorism could be problematic. 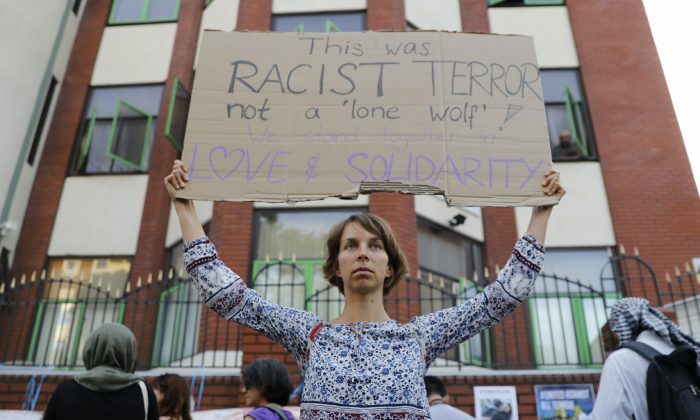 Sociologist Frank Furedi thinks that the way the Finsbury Park attack was classified as terrorism was a way for the government to counterbalance the London Bridge attack, to appear even-handed. However, he also said that generally there is a counter-trend to calling everything terrorism and playing the fear card. “At the moment, in view of the chaotic state of affairs, officials and governments would rather things were not terrorists than they were,” he said.